Mercedes-Benz has released details of the SLK 250 CDI, the first SLK with a diesel engine, and the SLK 55 AMG, the high performance V8 variant. While the diesel is, as you’d expect, rather efficient, the AMG is impressively frugal too. The frugal diesel version of the new SLK roadster manages an impressive 56.5mpg on the combined cycle, but Mercedes-Benz promise that despite its diesel engine it will remain entertaining to drive. With 500Nm of torque it should certainly pack a decent punch, and 0-62mph takes a brisk, if not astonishing, 6.7 seconds. The 2.2-litre engine produces 204bhp, making it the most powerful diesel model in its class. It fitted with twin turbochargers and high pressure common rail direct injection. The transmission is a 7G-TRONIC PLUS automatic, and a manual will follow after the initial launch. The interior is styled after the SLS AMG supercar, with chrome vents and high quality trim fit and finish, and an AIRSCARF system to keep the driver and passenger warm when the roof is folded. A folding hard top roof is standard, but a polycarbonate roof is available as an option. This system is tinted, but, at the press of a button, can be made almost entirely transparent. 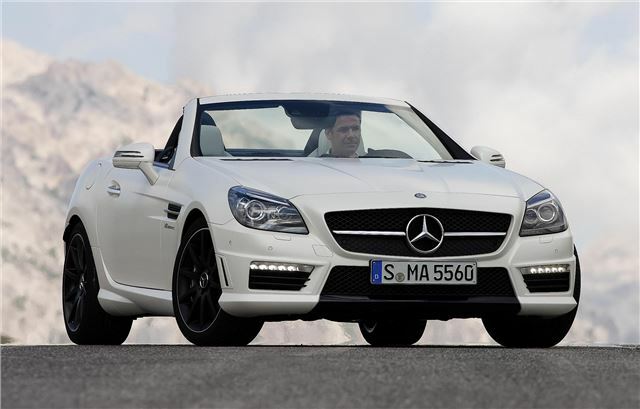 The new SLK55 AMG features an extremely efficient V8 engine, and produces 422bhp and 540Nm of torque. The coupe cabriolet manages 33.6 mpg and 195g/km despite its blistering performance – 0-60mph takes 4.6 seconds and top speed is limited to 155mph. The fuel economy may not be impressive in the grand scheme of things but for a naturally aspirated 5.5-litre V8 it’s a tremendous figure. Some of the fuel saving tech fitted includes a stop/start system, high pressure direct injection and cylinder shut off, which shuts down four of the eight cylinders when they’re not needed. The AMG SPEEDSHIFT seven-speed automatic gearbox has a ‘controlled efficiency’ setting too, as well as a sports and manual set-up. In the more efficient four cylinder mode the exhaust note is quiet and subdued, but flaps in exhaust open at higher RPMs to make a more enjoyable and more typically AMG sound. The SLK 55 AMG should prove capable both as a comfortable cruiser and through the bends, thanks to AMG sports suspension, Torque Vectoring Brakes and AMG Direct-Steer technologies. The direct-steer system is light and easy to operate at low speeds but weights up at higher speeds, providing feedback when the driver needs it most. The Torque Vectoring Brakes help to keep the car on the road on difficult bends by braking the rear wheels selectively when necessary. There’s also a three stage ESP system to suit all driving styles. The styling is typically AMG, with beefed up bumpers and sills and a bulging bonnet, along with the usual smattering of AMG badges and quad exit oval exhausts. The new SLK 55 AMG and SLK 250 CDI will launch in the UK in January, but pricing and specification details are unavailable at this stage.